High Holidays at Chabad is about connection, inspiration and joy. You will find an engaging experience filled with joyous song, meaning and insight, with explanations offered throughout the service. Our services are a fusion of Hassidic spirit, with a bit of a Sefardic spice and a lot of love and joy. You will dance, sing, reflect, cry and laugh. Yossi Shanowitz is founder and director of Chabad of Westmount, known simply as “Rabbi Yossi”. 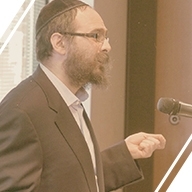 Rabbi Yossi brings his vast knowledge in Talmud, Jewish Law and Chabad philosophy, as well as his warm and personal approach. Rabbi Yossi received his rabbinic ordination from Tomche Tmimim Yeshiva in New York.